In my quest to discover what it was truly like to wear the clothes of an Edwardian woman, I discovered the wonderful, bubbly and highly-praised reenactment actress, Kandie Carle. Through period-correct clothing and undergarments, Carle shares intriguing anecdotes and facts about the history of the undergarments, etiquette, leisure activities and home life of women and men of the Civil War, Victorian and Edwardian eras! Her level of expertise was too good to pass up, and with strength and humor matching our Victorian & Edwardian forbears, Ms. Carle kindly took time out of her busy schedule to answer a few questions and in the process, clear up a few misconceptions about both women and women’s clothing. What attracts you to the Victorian/Edwardian era? Initially it was my family history. I have photos of my Great-Grandmother in the 1890s. Then, doing research on different time periods as an actress, I was intrigued by the women I was reading about. 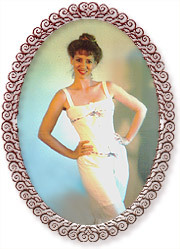 Then, in 1992 I began dancing in a vintage dance performance group and my research had to branch out into the clothing and fashion in particular. As a seamstress I made my own clothing for the balls and dance demos. From there, I was hooked. I loved so much abut the women of the Victorian and Edwardian time periods, their attempts to get the vote, their moving into the workforce, and yet keeping their femininity. I also appreciated the beauty. If you say anything about the time period, you must say it was lovely. The hair, the clothes, the automobiles, home furnishings, even their calling cards. It was ornate, and beautiful. When you slip on a costume, do you feel transformed into the woman you’re portraying? Absolutely. Physically, I wear all of the appropriate foundation undergarments, so I stand taller, straighter, and feel automatically more lady-like. I also find myself behaving with more grace and refinement. Did Victorian belles really have 15 inch waists? If you were 13 years old! We always focus on the exception instead of the norm. 15 years of research has shown me that there are many misconceptions about women’s sizes. Certainly we are much larger in terms of weight and girth, but the median height is almost the same: 5′ 4″ to 5′ 6″. Simply standing up straight changes measurements all over the body. There is a 3″ difference in the measurement across my shoulders when I am standing up straight. Add wearing a corset, as young teenagers did, and you may get a 15″ waist. Extant garments which look like adult fashions, many times are actually teenagers clothing, but the styles were so similar, that when compared to the adult fashion plates, we think they are adult women’s clothing! 100 years ago a 15 year old’s dress was shorter, but almost exactly in the style of an adult. Were there some tight lacing? Sure, was that everyone? No. 100 years from now people will say of us: “Everyone did what Michael Jackson did to himself”. Generalities and stereotyping do a disservice to everyday women of the past who were as varied in stature, height and size as we are today. They certainly didn’t weigh as much, but they weren’t midgets. Specialty attire like wedding gowns, can appear very small to our eye. They were wearing a corset and may have cinched themselves in tighter for the occasion. I challenge any woman of today to deny that they not only lose weight for their weddings, but often wear a tight wedding dress, then three weeks later they are back to their normal size and wouldn’t be able to get into their wedding dress! That’s not a new thing. Also keep in mind that larger clothes were frequently cut down to be made into children’s clothing or made into quilts, etc. So what survives, of everyday people’s clothing, tends to be special occasion or young ladies clothes. I am not referring to the fashionistas of the day, like the Vanderbilts, I am talking about every day women. 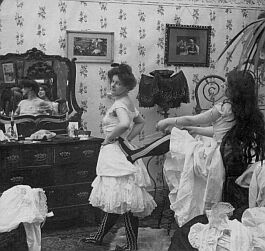 How has the corsetry and undergarments shaped the way you think about the Victorian/Edwardian era woman? Many women were slaves to fashion then, just as many women are today. Look at the incredible use of plastic surgery and cosmetic treatments to achieve what we think of as ideal beauty today. How many women have/will have bunions and other foot problems because of the incessant attachment we have to high heeled shoes? Vanity knows no age. Corsetry of the Victorian and Edwardian eras was a tool they used to achieve what they thought of as the ideal female form. The hourglass, the S curve, the straight ‘Titanic’ era undergarments, etc. all served the purpose of supporting a specific silhouette. If you are genetically predisposed to have an hourglass shape then you will have no trouble getting into an hourglass shaped corset and being relatively comfortable in it. I can wear my Victorian corsetry for several hours while dancing at vintage balls without discomfort because of two things: I made them to fit me, [and] I don’t cinch them in too tightly. It is all relative, especially when you consider they grew up wearing them. They were used it. We are not, so when we do occasionally wear one they are uncomfortable and restrictive. I am amazed at how much the women of the Victorian and Edwardian eras achieved, given their restrictive clothing and undergarments. My respect for them doubled once I experienced living a day in the clothes. We need to remember, corsetry was common underwear. In 1900 1,200 workers were cranking out corsets at the Royal Corset factory in Worcester MA. What research have you done to get into the mind of the Victorian/Edwardian lady? My research is ongoing, and I must say it is a lot of fun for me. I have every kind of book imaginable on the subject of clothing, lifestyle, patents, inventions, literature, trades, slavery, sweatshops, dressmaking, sewing manuals, marriage, motherhood, jobs, travel…and the list goes on. I have the diaries, the letters, the biographies and autobiographies as well as the newspapers, catalogues and ladies magazines of the day. They all show me what everyday people were being enticed to buy and use. Articles on politics and the suffragette movement are integral to my presentations. Knowing what and who was in the news of the day is important. Describe a typical Victorian/Edwardian lady’s day. There is no such thing as a typical day for anyone of any time period. It was really dependent on where in the country you lived and where you were in class and station. The typical day for a working class woman is vastly different than the typical day of a middle class woman who was running a household. 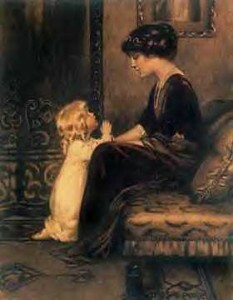 In turn, the wealthy ladies had a totally different experience of day to day living. In my programs I focus on middle-class women who may have the resources to hire an extra pair of hands to help with the laundry, cooking, cleaning and taking care of the children. There were educated women in the work force in many types of jobs. Her life was going to be very different from the housewife or factory worker. On the whole we need to keep in mind that communities were smaller, and the workload to keep house was much more time consuming than it is for us today. No microwaves, no electric stoves, no automobiles, no indoor plumbing, no automatic washing machines. Washboards and ringer washers were the staple of an Edwardian household of the middle-class, still very labor intensive. Then there was the ironing, with an iron, made of iron! Social obligations also varied dependent on the position you held in your community. How do the actual garments feel (weight, fabric sensation, walking/running/riding,etc)? They are heavier than our contemporary clothes, mostly due to the layers and heft of fiber content in the fabrics. I wear authentic pieces for my presentation when it’s an indoor show, (always with a body stocking between my skin and the textile…I want these things to last another 100 years!) and I never wear the real stuff to dance in. When I wear reproduction garments, they are made as close to the originals as possible, including weight and fiber content. No polyester or nylon to lighten the load! For me the biggest difference is the heat. With very little skin exposed, I get warm very fast. Which was helpful 100 years ago when they didn’t have regulated heat in their homes or workplaces, but not fun when I am doing a presentation in a 75 degree room! When I dance, I try to wear lighter weight clothing as they did, as it is an aerobic activity. The corset requires that I relax into it, not struggle or fight against it. It becomes my exoskeleton and is very supportive, especially on the back. And as gravity is not our friend, I can say that it is much nicer to be supported from the under bust gussets in a corset rather than elastic straps down from my shoulders! No wonder we have hunched backs today! What is the most rewarding experience of doing what you do? I have a couple of main goals in doing my programs. First, to debunk some myths and stereotypes that have been passed down the ages, mainly from badly researched romance novels and TV shows and films like Gone With The Wind. No, they didn’t faint all the time. Yes, they did all kinds of sporting activities, many worked outside the home. Yes, many were educated, more women had a higher education than we give them credit for,etc.etc. Second, if I can get just one person in each audience to look at their own family’s history in a different light, with more appreciation and respect, then I feel I have done my job. Everyday women of 100 years ago were the movers and shakers of their families and towns, but seldom get their names in the history books. I hope the women and men who come and see my programs go home and record their family’s history and pass it on to the younger people in their lives. I also want to bring to light the things we take for granted today, like women voting. We didn’t get the vote until 1920, and it was hard fought for. Some women literally gave up their lives and/or were scorned as terrorists. And yet women today, ages 18-35 comprise the smallest voting populace in the US. That makes me very sad. If women today knew 1/4 of what I know of what the women went through 100 years ago during the height of the suffrage movement, they would never pass a polling place again. They’d go in and vote and say thank you to those women, without whom none of us may ever have gotten the voice in the political arena we enjoy today. We even have a woman running for President…for the second time. Yep, another woman in US history ran for president. Here’s a hint…it was in 1872! If you could go back in time, where would you go, who would you be, and why? Wow, I have thought of this many times. I know that I would want to be in my 20s living in the 1890s, I would own a book shop or be a librarian, I would want to be married, without children, living in New England somewhere. A mid-sized city with agriculture nearby. Any funny anecdotes concerning your profession? Too many to count, as I have been doing my Victorian Lady programs for 11 years now. It is always fun when gentlemen are in attendance, as there is a lot of humor in my programs. A couple of stories stick out amongst many…One organization decided to market my program as a Reverse Strip Tea (as I get dressed from the inside out, not strip from the outside down). They had a fellow call up and ask if he could make reservations for his buddy’s bachelor party! He was advised that it may not be the event they thought it was and the guy went elsewhere. Twice during my shows I have had a corset lace break as my volunteer was lacing me up. That is always interesting, as the clothes don’t fit if the corset isn’t laced properly, so the show comes to a halt until we can rig the corset to close. I now travel with a back up lace, just in case of a ‘wardrobe malfunction’!